Salvarsan, also known as 606, was a synthetic drug developed by the scientist Paul Ehrlich in 1909 to treat syphilis. It was a path-breaking development that revolutionized the American medical profession’s ability to treat the disease. When World War I broke out and venereal disease became a problem, the US Army Medical Department invested in appliances and stations to inject infected soldiers and rid their bodies of the disease. Injecting the diluted yellow Salvarsan treatment was difficult for the practitioner, painful for the recipient, and not an immediate cure. Hugh Hampton Young and others in the US Army Medical Department would have to rely just as heavily, if not more, on measures to prevent the disease altogether. 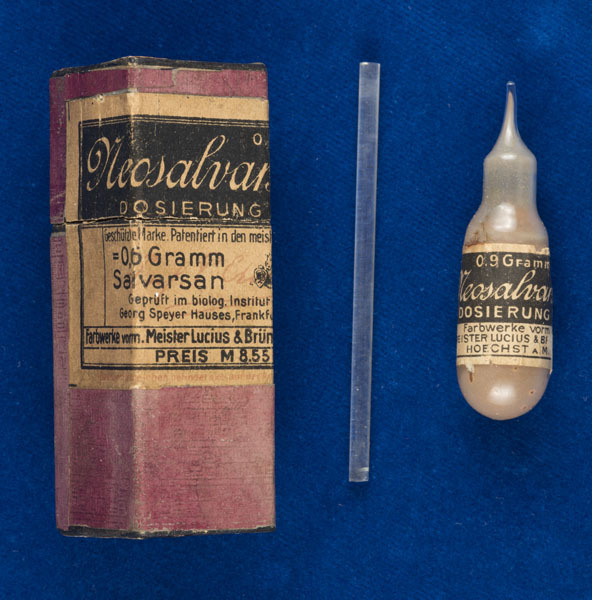 “Sealed vial of Salvarsan and packaging,” Exhibits: The Sheridan Libraries and Museums, accessed April 19, 2019, https://exhibits.library.jhu.edu/items/show/519.